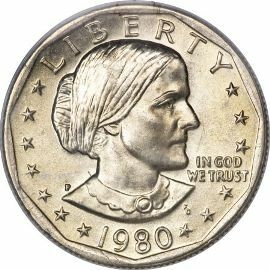 The Susan B Anthony dollar coin was produced at the US Mint from 1979 to 1981 and again in 1999. 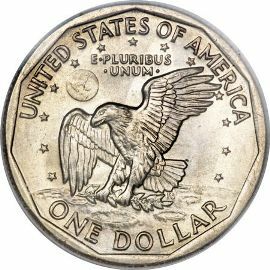 The main purpose of the coin was to replace paper dollars with a coin of the same denomination. Coins are much more durable and can remain in circulation for many more years than paper money; this made it more economical for the mint to produce them. similar in size to Washington Quarters and they were immediately mistaken for them. Because of this the coins were discontinued for a period of almost twenty years. SBA Dollars returned to production in 1999 for one final year to complete the series. The Anthony dollar features on its obverse a right-facing bust of the famed advocate of women’s rights. It also has the motto "LIBERTY" above and the date of the coin below. On either side of her portrait are arcs of thirteen stars, with the motto "IN GOD WE TRUST" to the right of her chin. The reverse shows the logo of Apollo XI, as mankind's first walk on the moon. The design is dominated by the American eagle descending to the lunar surface, grasping the olive branch of peace in its claws. A view of Earth appears above the eagle with the motto "E PLURIBUS UNUM". The inscription "UNITED STATES OF AMERICA" is above and the denomination "ONE DOLLAR" below. alloy, bonded to a pure copper core.